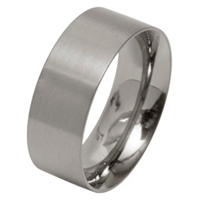 A simply styled Titanium court band with two inlaid narrow stripes of Silver equally spaced. The ring measures 6mm in width, the exterior of the ring has a satin texture, whilst the smooth rounded interior has a high polish. The ring is marked inside with the manufacturers mark "UNQ" (Unique) '925' (Silver) and "TITANIUM" so that you can be sure that you are receiving a genuine branded item.